Up early on Sunday. I’ve got a lot to accomplish this week with getting ready for our trip and emptying the storage unit, so I wanted to get an early start. I was still hard at work on the computer, catching up on blog reading and doing some updating on BCDC (more to come) when Ralph got up. I hadn’t had anything to eat yet. He asked if I’d like to share his coffee (what a sweetie!) 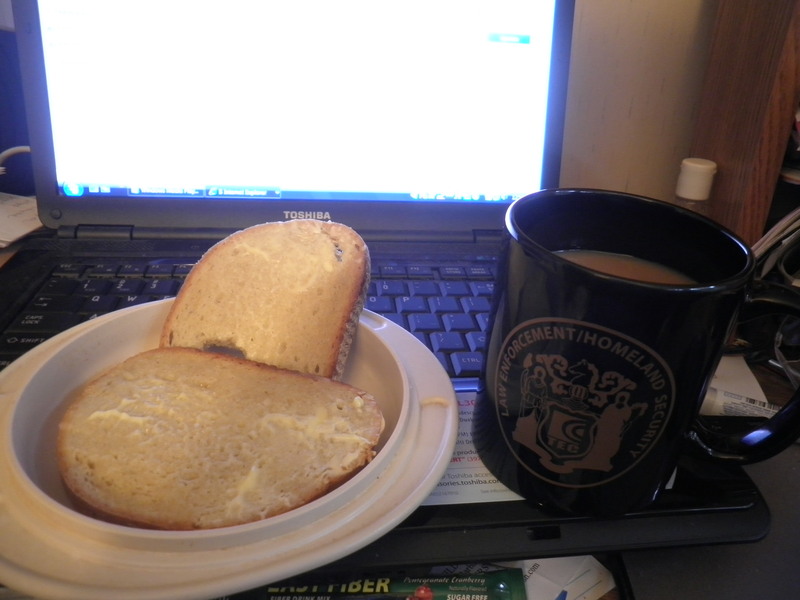 and asked if I wanted some toast. A local store carries this wonderful rye and marble rye bread which comes in fresh. It’s one of Ralph’s favorites and he gets it pretty regularly. Very tasty and it held me over. Late morning found me at my sister, Ele’s house. I had left her with a dining room full of boxes from the storage unit. I wanted to get them upstairs to their new temporary home. Together we got most of them up there. I’ll be filling it up some more today with the last of what’s in the unit. Cannot Wait to have that finished!! Thanks to Ele for helping me with this! Mid afternoon, Ralph decided we needed some lunch/dinner. We decided on the Gateway Diner. They have something on their menu that I’ve been meaning to try. We go there so often for breakfast, not so often for lunch or dinner. I know now that when it’s a lunch/dinner visit there, This will be my go-to choice. 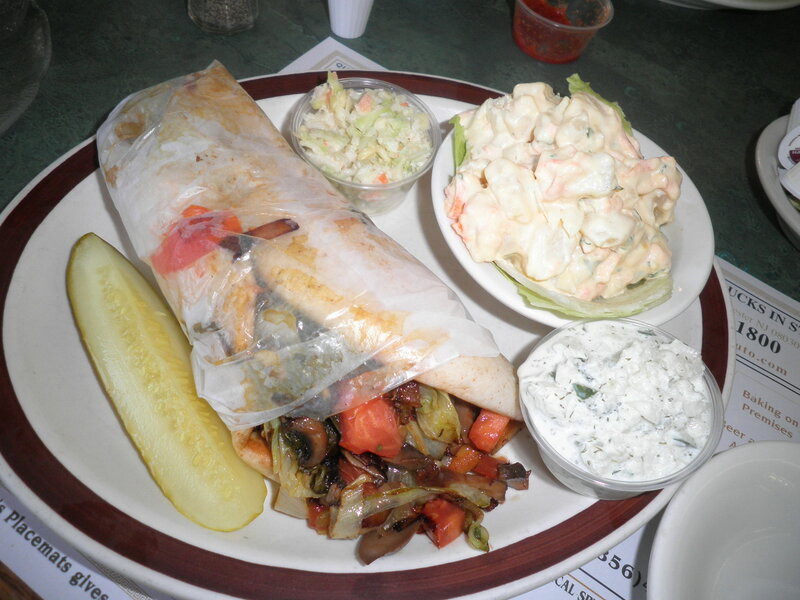 May I present…the Vegetable Gyro Special! 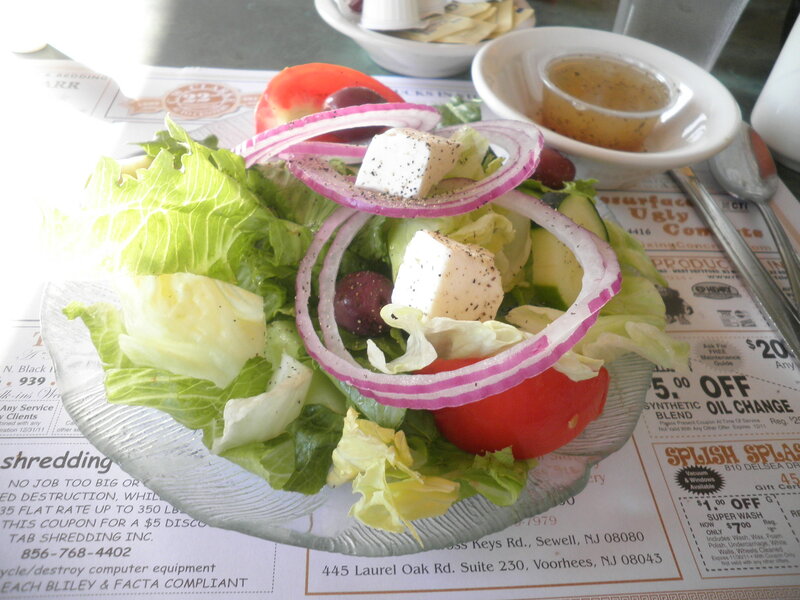 The special comes with a small Greek Salad. No problem there for me! Asked for the dressing on the side and it was so tasty! This was so delicious and very much worth waiting for. I know I will order it again. Any vegetarians in this area really need to try this. It is the best! The bread was soft and fluffy and the veggies were nicely spiced. It was however VERY MESSY! Ask for extra napkins to start! Monday morning and I’m just waiting until it’s time that I can get into the storage unit and do the last of my clean out. I can’t tell you how glad I am that it will be finished. Countdown…5 days to the Road Trip!! Off to face the day…Happy Monday!! Thanks for the heads up, Kristen! Actually, I just put it there for the photo. Thought it looked “bloggy”…am I wrong?!? You’ve GOT to try this gyro…the Best! definitely ‘bloggy’. And I think I’ll go move my cup of coffee off the laptop now…. Good one, Val! I enjoyed the show yesterday!